3rd ARQ (robotics) seminar. 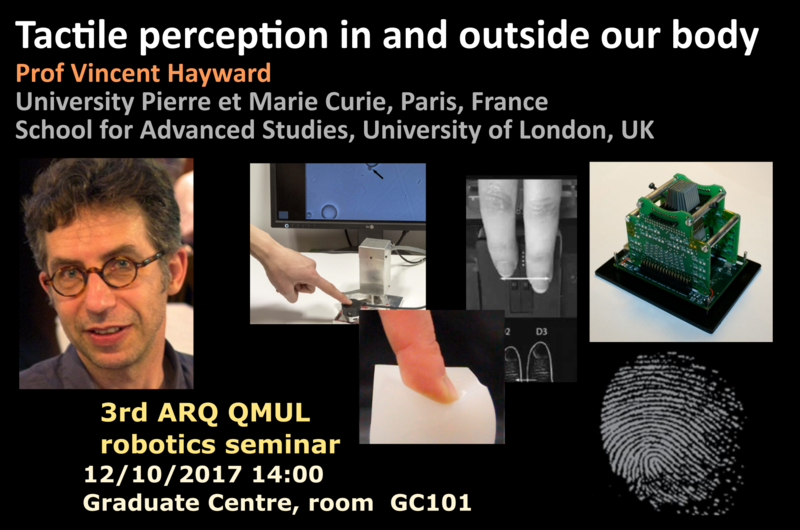 Professor Vincent Hayward will talk on haptics and tactile perception. The mechanics of contact and friction is to touch what sound waves are to audition, and what light waves are to vision. The complex physics of contact and its consequences inside our sensitive tissues, however, differ in fundamental ways from the physics of acoustics and optics. The astonishing variety of phenomena resulting from the contact between fingers and objects is likely to have fashioned our somatosensory system at all its levels of it organisation, from early mechanics to cognition. The talk will illustrate this idea through a variety of specific examples that show how surface physics shape the messages that are sent to the brain, providing completely new opportunities for applications of human machines interfaces.